Most people have dealt with some form of memory loss at some point. Usually, it is a momentary lapse where they can't recall something like a person's name, where they left their car keys, or what they had for breakfast that morning. This is often referred to as "brain fog" and is perfectly normal, although it can be irritating and embarrassing. However, when a woman passes through menopause, "brain fog" can become a much more regular occurrence. Recollection of information that she has just been told may be quickly be forgotten. Once a woman had recognized that she is dealing with memory lapses, it is a good idea to work on developing coping mechanisms and other ways to deal with them. It takes the brain eight seconds of intense concentration to process new information as a short-term memory. Make eye contact and listen closely when someone is providing you with information you want to remember. Also, paraphrase information when you get it so that it is more easily registered, and minimize distractions by multitasking less frequently and finishing one task before starting a new one. You are much more likely to remember information if you use as many of your senses as possible. The majority of information that women will forget during menopause has been conveyed to them in visual or audio form. If you record the information in a second way - such as writing it down or relating it to a smell - then you will have a better chance of recalling it later. Use old knowledge to help you maintain new knowledge. You will just be adding to information that is already stored rather than creating a new memory. For example, if you want to remember a new address, then make a point of connecting that new address with a familiar location nearby. This tip is simple, but difficult for many people to carry out. Use diaries and written notes to remind yourself of important dates, meetings, and activities. Make sure this book is always easily at hand. Nowadays, smartphones can also help with this. The process of recording information should help you later recall of it, too. 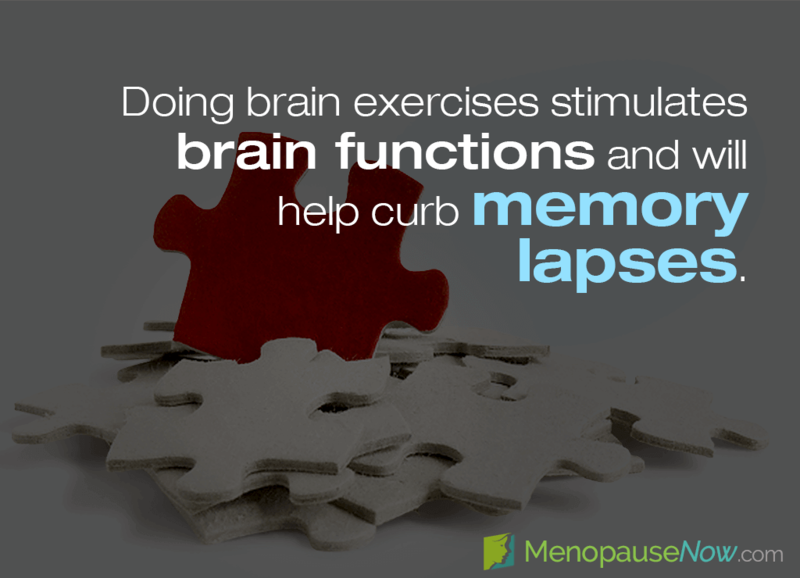 Brain exercises can help curb memory lapses because they stimulate your cerebral functions. Try, for example, crosswords, Sudoku puzzles, or a game of Scrabble. Alternatively, try sensory or cognitive training games. Some examples of these include trying to brush your teeth with your other hand or getting dressed with your eyes shut, which encourages your brain to work in new and challenging ways. Studies suggest that women who are nearing or already experiencing menopause are 95% more likely to experience memory lapses than other women. Some memory lapses are caused by an imbalance of hormones, but may be minimized if certain measures are taken. Find out more information about memory lapse treatments by clicking on the previous link. The key to an honest relationship is communication; read on to find tips for discussing menopausal memory loss with your partner. Find practical solutions and positive habits to strengthen cognitive function and improve memory to combat menopausal brain fogs. Alcohol can cause memory blackouts and long term memory problems; read on to learn why, and how to prevent this.